Link Light Rail Seattle – Opening Day, originally uploaded by LeeLeFever. Ahead of schedule and under budget, Sound Transit is apparently ready to start talking about a possible early opening for the $1.9 billion, 3.1 mile, U-Link light rail extension connecting downtown to UW’s southeastern edge via Capitol Hill Station. But don’t get too excited — we’re talking months, not years. At Thursday’s Sound Transit board meeting, CEO Joni Earl announced discussions are underway with contractors to determine the cost of moving the schedule up from the current planned opening of September 2016. A Sound Transit briefing document on a “Potential early University Link Opening” is below. Thursday’s board meeting also included an important vote on the development agreement for the Sound Transit-owned properties around the Broadway station site. As expected the board authorized the plan forged by a multi-year community process and the Seattle City Council to create a framework for affordable housing, retail and community space in developments that will soar some 85 feet adjacent the neighboring station. With the possibility of an early completion of construction on the light rail system and Capitol Hill Station, Sound Transit is planning for the development properties to be ready for construction to begin in March 2016. In Thursday’s board meeting discussion about the possibilities for an early opening of the line and the release of the briefing document, Sound Transit is talking publicly for the first time about plans to take advantage of the speedy pace even as work on Capitol Hill Station is only about a quarter complete. The agency also says an early opening would have to be coordinated with King County Metro, the City of Seattle, UW and the Federal Transit Administration. According to the Sound Transit document, the agency expects to know more about the possibility of an early opening by the end of 2013. In the meantime, work to finish the First Hill streetcar through to the interim Denny Way terminus is on pace for a spring 2014 opening. With the current 6-month float, light rail may now make its own spring debut on Capitol Hill two years later. This entry was posted in News, etc. and tagged light rail, streetcar, transit by jseattle. Bookmark the permalink. Originally slated to open in the 2005-2006 time frame, Sound Transit light rail to the University District will open as early as Spring 2016, 10 years late and $1.8 billion dollars over budget. The cost of the 2 stations and tunneling from downtown to the University District will cost the same as the entire 26 station line was projected to cost in 1996 (in 1996 dollars). 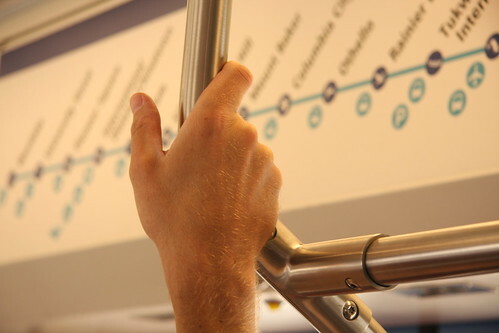 When the next phase open, there will be a total of 14 stations, half of the promised number when the original bond measure was approved by voters in 1996. Originally ST projected 100,000 riders per day. In reality, after approximately 4 years of operation on a partial system, Central Link has reached an all time high of 32,000 riders per day as of the second quarter of 2013. Still to be constructed is the final phase of the original proposal–the lines from the University District to Northgate. This section is currently projected to open 17 years behind schedule. OK, Sound Transit has done a good job of keeping this extension on-time and even possibly under budget, but the above paragraph is the rest of the story. Way late, way over budget, and way under ridership projections from the voter approved proposal. Is it any wonder that governments are held in such low esteem by the public?